Just returned from a long weekend in Barcelona. To say that I was blown away by the audacious innovation exhibited there would be an understatement. Specifically, I’m referring to the Gaudi architecture, although the whole city is bursting with beauty. Of course I’d heard of Gaudi before the trip and seen pictures in books and such, but seeing the real thing was an eye opener. His unfinished masterpiece the Sacrada Familia church is breathtaking. Impressive also is the vision of the city to continue building something that won’t be finished until 2030. Travel is one of those not-so-secret keys to enhanced creativity isn’t it? You learn to see with new eyes as a result. 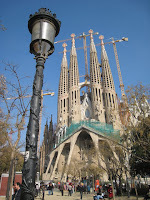 Gaudi’s work is deeply inspirational and it supports my belief that innovation is often underscored by a deep spirituality (see my article on Elvis and Einstein http://www.greggfraley.com/elviseroseinstein.html ) and a relationship with nature. It also supports the notion that expertise is not an inhibitor to innovation. There was a flurry of press not long ago, which essentially said that being an expert would close your eyes to new ideas within your own area. I understand that but have always thought that new combinations often result from knowing thoroughly what you can combine. In reading up on Antoni Gaudi I learn that he studied materials and building crafts from a very early age and he never stopped. The reason he could build La Pedrera (http://en.wikipedia.org/wiki/Casa_Mil%C3%A0 ), this amazing apartment building, is because he technically knew how to break the existing rules and get away with it. An imaginative architect without Gaudi’s deep knowledge of materials could have never pulled that off. Gaudi was impressive. Just as impressive was the level of highly professional crooks that roam the streets! My travel partner, who will remain nameless here, had her purse stolen right off the chair she was sitting on. I’ll use the word audacious again and break a long-standing rule not to overuse that word. These guys were good. We were sitting at a bar eating some lovely tapas and were engaged in a great conversation about the soul of business with a British venture capitalist sitting next to us. Her purse was actually under her coat! Enough of it must have been visible to clue them in unfortunately. Suddenly she shouted, “they’ve nicked my purse” and we looked to the doorway and they were already in the wind. While it’s shocking and inconvenient you can’t help but admire the creativity and expertise. The theft required good fact-finding skills, assessment of risk, intuition about value, quick decision making (convergence) and courage. Our bar neighbors commented later that three men were hovering behind us for a few minutes, then, using the classic technique of a distraction, bumped both the neighbor and lightly grazed my partner. At that moment the coat was lifted and the purse snatched. We were too busy talking to notice but my partner became aware fairly quickly, just not fast enough to prevent or catch these bums. Barcelona is beautiful, dangerous, and a highly creative city in two directions. Go visit to be enchanted by its beauty but for goodness sake keep your bag in front of you and strapped on. Gregg Fraley works as an innovation consultant to Fortune 500 companies and does keynote speeches and workshops on creative thinking, innovation, problem solving, and new-product development. An idea generation expert, he leads on-site and virtual brainstorming/ideation sessions for his clients.